What Is the Criss-Cross Hungarian Stitch? The Criss-Cross Hungarian is a textured filling needlepoint technique worked in rows of diagonal stitches, with each row facing the opposite direction. The placement of these stitches creates small spaces of one canvas mesh intersections that can be filled in with other basic needlepoint stitches. 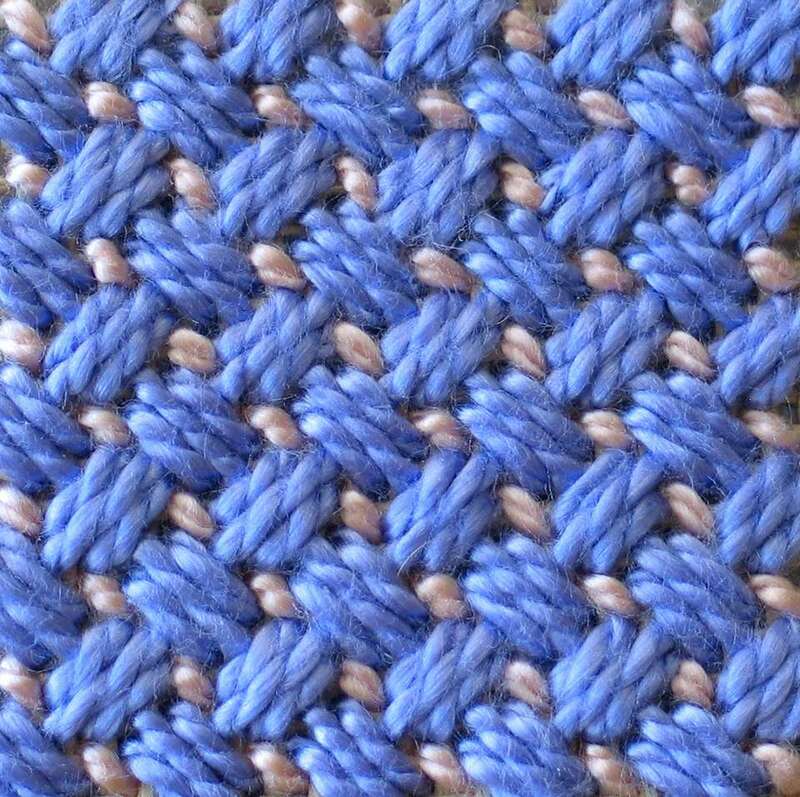 Similar to the Hungarian Point Needlepoint Stitch, one "stitch" is a group of three stitches worked diagonally over 2, then 4, and again 2 canvas threads. To achieve the Criss-Cross effect, each subsequent row is then worked in the opposite direction from the previous row. There are many opportunities to use this highly decorative needlepoint stitch technique when making a project. Here are a few of the most common ways. As a Textured Needlepoint Border: Several rows of Criss-Cross Hungarian stitches can be used as a needlepoint border to draw attention to a single central design motif. Depending on the thickness and type of needlepoint thread used, it can create a beautiful textured pattern to frame the needlepoint design. For Strikingly Realistic Leaves: When worked with green thread, each group of Criss-Cross Hungarian stitches looks like a small leaf—especially when using different shades of green and alternating these as you work across one or two rows. For an even more striking effect, each group of stitches in the same row can be alternated in different directions to create stunning light-and-shadow accents. As a Background Fill: Since the Criss-Cross Hungarian Stitch is an excellent background filling stitch, you can work it in a single color and use it along with other decorative stitches to complete a much larger needlepoint project. For Color Effects: Different colors create equally different effects when working this stitch. For example, when stitched in dark earth tones like brown and deep orange, it can be used to work authentic looking Native American designs. Ideal for Embellishments: Add beads and other tiny found objects in the spaces between rows to create tiny flowers or berries. In many ways, this Hungarian Stitch Variation is easier to work than the basic stitch. Since the stitches slant diagonally, you will not need to use as much thread to get good coverage. As you work the stitch, make sure to keep the thread strands short—no more than 18 inches long. Watch your stitching tension. The tendency is to make the stitches too tight when working diagonally across the canvas. Keep the tension even by following the detailed steps below. After each row, stop stitching to check for proper placement of the Criss-Cross groups. Missing the space between groups is easy. This area is very important for it will be needed to make the single stitch that gives the Criss-Cross Hungarian Variation its decorative flair. To work a row of Criss-Cross Hungarian, working left-to-right, bring your needle up through the canvas and over two canvas mesh intersections diagonally (see positions 1-2 on the above stitch diagram). Next, bring your needle up one canvas mesh under the position (1), spaced one hole to the left and work a stitch over three intersections at positions (3-4). Work the next stitch over two intersections at positions (5-6). Skip one canvas mesh and continue working steps 1 and 2 across the row. The next row is worked in the same manner but with the stitches slanting diagonally in the opposite direction. Once all the Criss-Cross stitches have been completed, work the individual filling stitches with Continental, French Knots or other decorative techniques in alternating rows or slanted in the opposite direction of the row of Hungarian stitches. Usually, the second color of stitching is worked in the resulting spaces between the rows; but this is the perfect area to use a specialty thread such as a metallic, or to add a seed bead.